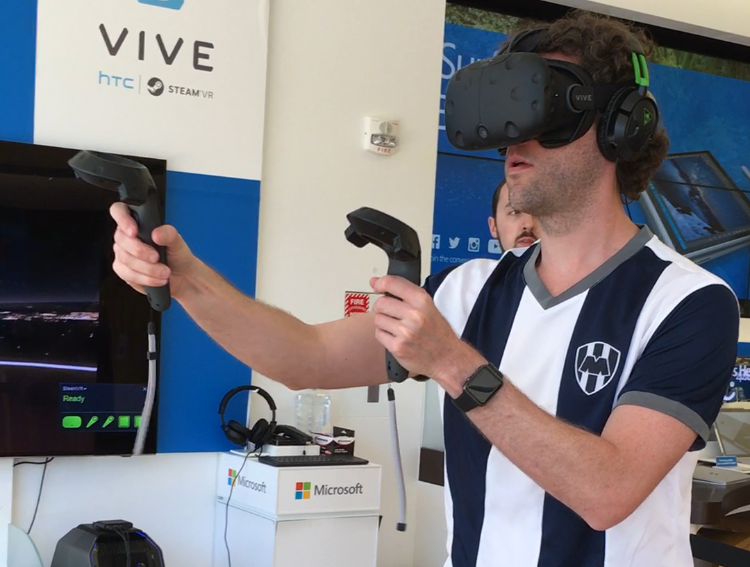 They have an HTC Vive demo setup at the local Microsoft Store (a. k. a. Bizarro Apple Store). This is a Virtual Reality headset, the biggest competitor to and not too different from the Oculus Rift that I tried out two years (!) ago. Positional tracking: you can walk around a small area/room and it knows where your head is. What you see matches your movements. The Oculus Rift I tried two years ago doesn’t have this, although the one going to consumers does. It doesn’t allow you to walk around though. Really cool controllers: This is very impressive. While “inside” VR you cannot really see yourself. But you can see the two controllers you are holding floating in the right spot. They had 3 demo apps. theBlue: Encounter puts you under the sea on a shipwreck. You can walk around a little but it’s mostly about looking around and listening. Very pretty. Tilt Brush by Google really wowed me. You use one of the controllers to “paint” in 3D space. With the other controller you can change brushes and colors. You can walk around your “paintings”. I started with a life-size stick figure, but when I reached the feet I figured I can draw in 3D space so started doing a running pose, one feet in front, the other in the back, etc. So much fun. Space Pirate Trainer is a shooting game in which. It’s really well made. You can hold a see-through shield on one hand. You can move around and dodge shots against little floating robots. Very neat. Am I going to get one? Who knows. I rarely play video games lately. But I can see this being extremely fun. It’s expensive though, $800 for the Vive + ~$1200 for a decent gaming PC that I don’t own. I’d need to set it up in a room. It sure is an attractive idea. But one needs to keep in mind that trying out demos for 10 minutes in not the same as using this for hours at a time. At this stage these VR rigs are really impressive, and they will only get progressively better: higher resolution (pixels are still too obvious), faster response, smoother tracking, wireless headsets, lighter headsets. Do yourself a favor and try it out. It’s worth trying on off-peak hours in order to avoid lines.